Antonio Gramsci defined the stages of crisis as those in which “the old has not yet died and the new cannot be born”. We have overcome that phase of stagnation and a new world is now being drawn before us, although it still has a blurry and uncertain profile conditioned by the assimilation of an economic and political-institutional crisis that has raised levels of distrust to heights of true risk. Technological disruptions, scientific advances, the digitization of the economy, globalization and the Asian boom are transforming at exponential speed a world we thought was solid and stable into one more fragile and dynamic. This acceleration of historical time is producing seemingly paradoxical phenomena such as the emergence of a future dominated by artificial intelligence and widespread progress that clashes with the return of nationalism and protectionism. 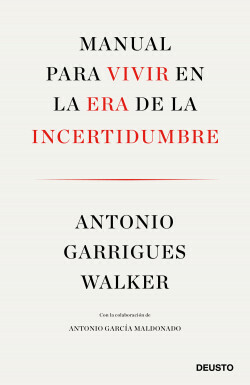 In this book, the legal expert Antonio Garrigues Walker sketches the general picture of a world that has become hard to grasp. Trying to sort out the chaos in which we feel we are living, Walker incisively analyzes the whys and wherefores of uncertainty. Far from utopias and dystopias, the author’s skeptical optimism dissects the essential themes that make up an era of uncertainty which this book will help to clarify.